Elyse: What do you want for dinner? Chris: What veggies do we have? 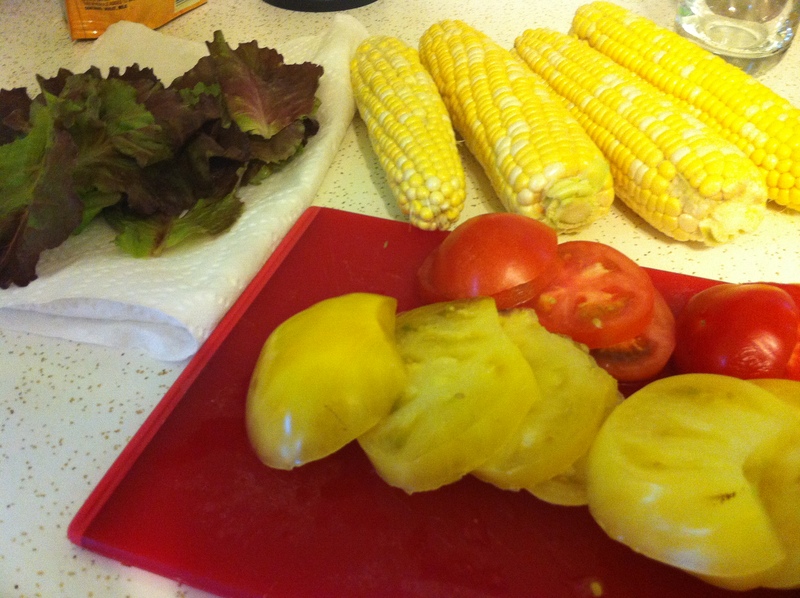 E: Well, we have green beans, corn, lettuce, tomato, eggplant…. C: Lettuce and tomato? We should make BLTs! And, that’s how an idea was born. We picked up some delicious bacon and whole grain bread from Heinen’s, cut up the red and yellow tomatoes from our latest Dean’s Greenhouse pick-up, cleaned and dried the lettuce from our box, and cooked the corn that came in our box as well. As an extra touch, I buttered the bread and then toasted it before making our sandwiches. The sandwich, corn, and slaw from earlier today made a perfect summer dinner! Luke the Cuke gives his Seal of Approval. 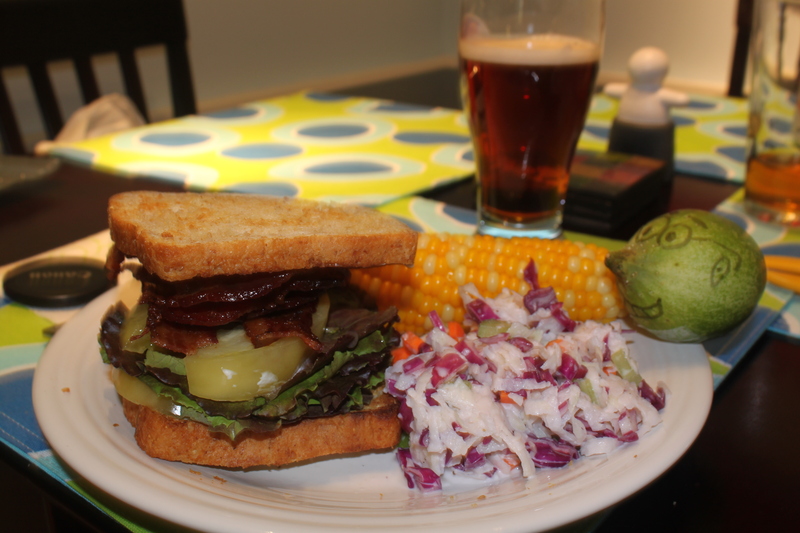 This entry was posted in CSA, Dinner, Luke the Cuke and tagged BLT, coleslaw, corn on July 30, 2011 by Elyse. Looks great! I love yellow tomatoes. I don’t know if it’s my imagination, but I think that they are less acidic- and great on sandwiches! BLT’s might possibly be the best sandwich ever! I think I have all the ingredients for that right now. But, I never think to make a BLT! Looks great! I love BLTs. I’ve also been making a lot of grilled cheese sandwiches lately, with a tomato slice in them. Both are great summer-time lunches! I have tried turkey bacon and it’s quite good. However, I couldn’t find it at Heinen’s, so we just got regular from the deli. It was worth every calorie! I bet! There’s nothing better in the summer than a great BLT!